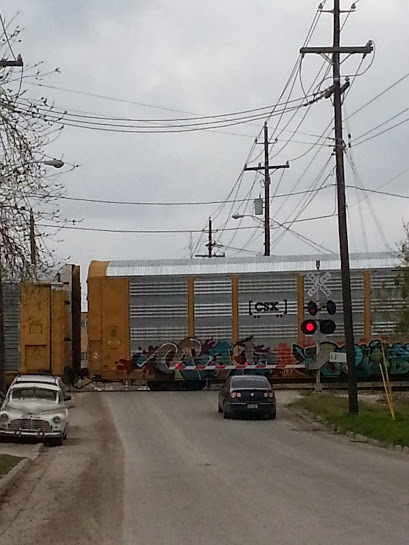 Several times a day, a train rumbles through our neighborhood. Johnny Cash may sing wistfully about the lonesome locomotive’s whistle, but there is nothing romantic about this train’s horn. The blasts come every few seconds as the long line of boxcars pass churches, parks and schools. The constant racket of the rails is a reminder of how much international commerce flows through Brownsville. This is the same train that immigrants from Central America and southern Mexico take to get to the US border. The migrants call the train “La Bestia” (the Beast), no doubt for the horrific accidents and deaths that often happen to those who choose to ride the rails. People fall from the train; people are thrown from the train. The amputations and the deaths are well-documented, and the rail line offers a daily chronicle of nightmares. A Beast indeed. Once, years ago, while visiting Honduras, I rode The Beast myself. I had clambered up on the roof for the absolutely inexcusable reason of wanting to have the experience. It was a terrifying few moments, as there was not much in the way of handholds. After a very short while, I crawled down the side of the car and back inside. I was shaking so badly that I couldn’t stand up. I cannot imagine the kind of physical and emotional strength required to survive a ride on the Beast that would last the days it takes to cross Mexico. A couple of weeks ago, three Honduran women who undoubtedly had taken this train for at least part of their journey, crossed the Rio Grande into the United States. Shortly afterwards, the women, two fourteen year olds and an older woman, surrendered to a passing border patrol agent. The agent took the three immigrants to a more isolated spot, and then raped them. He tried to break the neck of one of the women, and she passed out, and was left for dead. He slashed the wrist of the second woman and left her to bleed to death. He then took the third woman, one of the fourteen year olds, to his apartment, tied her up, put a sock in her mouth, and then went back on duty. In the meantime, other Border Patrol agents rescued the wounded women, who reported that the assault had been done by a man dressed like a border patrolman. The agent, apparently realizing that he was found out, returned to his apartment and, as police officers moved in on him, shot himself to death. When police entered the apartment, they found the other fourteen year old immigrant–naked, bound and gagged. “Horror” is an inadequate term to describe what she experienced that day. “Fury and disgust” do not capture the reaction of Valley residents, especially women, to the event. The three women, according to the office of Homeland Security, were reunited with family members and were having their immigration status “adjusted”. The Border Patrol Union released an advisory denouncing the agent as a criminal. The train’s horn blares; carting its wares, as it crosses, once again, through my community. A border patrol truck pauses at the stop sign beside our home, and then roars off, that agent doing his part to keep our border secure.